Because my Sherlock obsession hasn't been dampened any by the brilliant series 2 closer. I know everyone's already said this but... no more Sherlock for another year? Seriously? I ordered this ([link]) copy of 'The Valley Of Fear' the other day and somehow that inspired this. 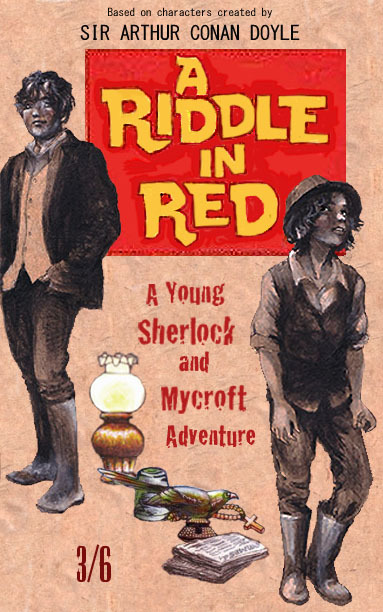 As per my comments attached to the original artwork for this I'm surprised that Sherlock has never been teamed up with his brother in the various 'young Sherlock' franchises. So I've rectified the situation. And cos mid-century children's book covers are awesome, that's apparently when this forgotten masterpiece was written :) This came out just so EXACTLY as I imagined it. The other, reason for this picture is that because Mycroft and Sherlock's relationship was one of my favourite things about series 2 of Sherlock. I particularly loved this is in the final episode: in the first scene in the Diogenes club, it's carefully set up that silence is mandatory. So when we see Mycroft in that setting after Sherlock's demise, I for one expected him to sob or something, breaking the club's silence. It would have been a powerful moment in another show. In this show it's far MORE powerful that that expectation is subverted and Mycroft in fact remains silent and contained. Of course, canonically, Mycroft is aware of his brother's survival from the off, but still. Incidentally, I can't believe how long it took me to come up with a usable play on the title 'A Study In Scarlet'.